2.00 p.m. R3 6 She’s A Thief (2 f Showcasing – Steal, by Red Ransom) – Jake Bayliss; emulated her impressive debut win when coasting to victory in the Wentwood Grange Premier (1200 metres) on 16 December at Te Rapa. Drawn barrier two in the $70,000 Barneswood Farm Eclipse Stakes (Gr. 3, 1200m), she strikes a small but select field and has the class to measure up. Fixed odds: $3.70 & $1.40. 3.10 p.m. R5 1 On the Rocks (3 c Alamosa – Cold Shoulder, by Volksraad) – Jake Bayliss; followed an impressive three-length Maiden win over a mile at Tauranga, stepping in class to win the Trevor Eagle Memorial (Listed, 1500m) here on 2 December. Ideally drawn (4) in the $100,000 Jamieson Park Auckland Guineas (Gr. 2, 1600m), he rates an each way chance in a very solid field. Fixed odds: $4.00 & $1.60. 6.12 p.m. R10 9 Ruby Armani (5 m Makfi – Trujillo, by Saint Ballado) – Jake Bayliss; was back in the winning groove with a polished performance in the Rating 70 1400 metres on 15 December at Tauranga, after finishing solidly in the Auckland Thoroughbred Breeders’ Stakes (Gr. 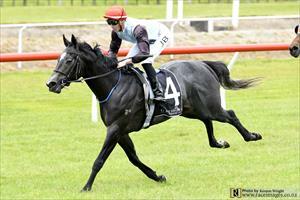 2, 1400m) on 25 November at Pukekohe. Drawn barrier six in the $50,000 Rating 75 1600 metres, two previous course attempts in stakes races, she brings the right form to produce another bold performance. Fixed odds: $8.80 & $3.10.